The name sounds like a teaser while it's appearance posed somewhat a challenge to me. Hence, without much thought, I headed to the supermarket to purchase all the required ingredients and literally jumped straight into the baking of this unconventional, strange-looking bread. (1) Adjust the oven rack to medium-low position and heat the oven to 100°C. Once the oven reaches the desired temperature, turn it off. (2) Coat all sides of the bundt pan with the softened butter. Set aside. (3) Mix the milk, water, melted butter, sugar and yeast in a cup. (4) Mix the flour and salt in a large bowl. (5) Make a well in the centre of the bowl and pour in the milk mixture. (6) Using a wooden spoon, incorporate all the ingredients till a dough is formed. (7) Turn the dough out onto a lightly floured work surface and knead for about 10 minutes until the dough is smooth and non-sticky. (8) Coat the bowl with oil prior to placing the dough in it. Coat the surface of the dough with oil as well. Cover the bowl with a plastic wrap and place in the warm oven till it doubles in size. Takes approximately an hour. (1) Melt the dark chocolate. (2) Add the ground cinnamon into the melted chocolate and mix well. Place the mixture in the refrigerator to harden it. (3) Once the chocolate-cinnamon mixture is hardened (approximately 30 minutes), chop it into small pieces with a knife. (1) To brown the butter, heat it at medium-high heat in a saucepan. Once the butter turns light brown, remove it at once from the heat. (2) Mix the brown sugar and cinnamon together in a bowl. Set aside. (1) Remove the risen dough from the oven and bowl. Shape it into a large 8" x 8" square and divide the square into 64 equal pieces using a knife. (2) Meanwhile, heat up the oven to 100°C and turn it off once the temperature is reached. 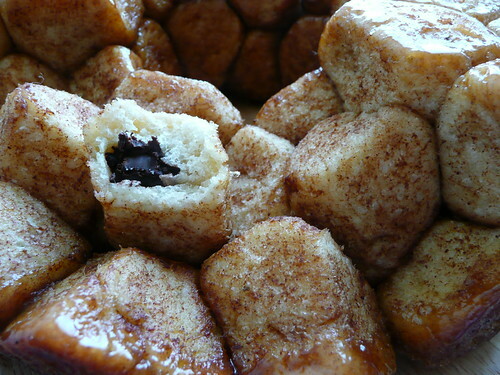 (3) Flatten each piece slightly and place some pieces of the chocolate-cinnamon mixture in the centre of the dough. Nip the edges together and roll it into a ball. (4) Dip each dough ball first into the melted browned butter before rolling it in the bowl of brown sugar-cinnamon mixture. (5) Place each dough ball in the buttered bundt pan and stack the balls next to each other leaving no gap. (6) Place the bundt pan in the warmed oven for another hour. This is to proof the dough a second time until the dough balls are approximately an inch below the rim. Remove from the oven. (7) Preheat the oven to 180°C and bake for ~ 30-35 minutes. (8) Remove from the oven and cool for not more than 5 minutes before turning it out from the bundt pan. 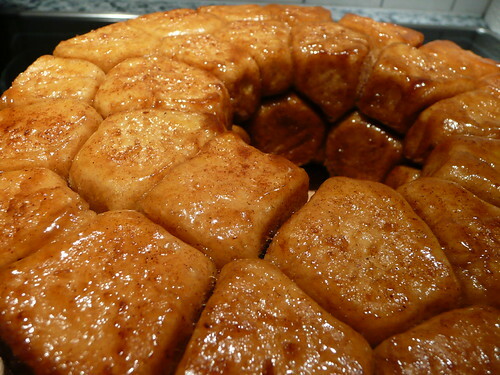 (-) This recipe yields a very sweet bread - sweet on both the outside and the inside! Too sweet for my liking. (-) Some suggestions to reduce the sugar level would be to use fine brown sugar and only coat the dough balls sparsely with it. Might also be an alternative to do away with the chocolate filling totally. (+) Although there are quite a number of steps, nevertheless, if you were to abide by these steps faithfully, I'm quite sure you'll end up with this interesting-looking bread to add to your baking book of conquest! (=) Best to bake and finish this bread on the very same day! As such, it would be quite a good idea to make it for a children's party where all the kids would be busy nipping away at the small pieces of bread.